Will This Be Adelaide's Tallest Skyscraper? 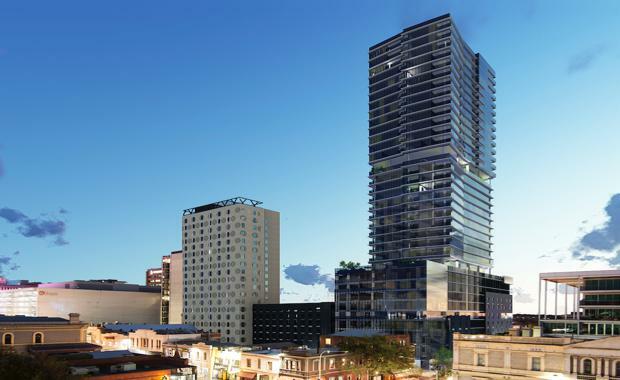 A new 36-level project planned for Frome Street, just off North Terrace, in the Adelaide CBD is set to become the city’s tallest residential tower. Developer Kyren Group has appointed Colliers International to market the slender mixed use building which is set to occupy a 4163sqm site at 11-27 Frome Street in the Adelaide CBD. The project will yield 88 apartments, with the residential component of the building occupying levels 22 to 36. The Frome Street development, which is currently before the Development Assessment Commission, features outdoor entertaining areas, an outdoor pool more than 10 floors up and luxury penthouses at the top. Developer Kyren presented its design to Adelaide City Council last week in order to make Tavistock Lane — which runs adjacent to the development on the south side — a public lane. AdelaideLevels 11 to 21 will comprise 60 one, two and three bed serviced apartments, while the ground floor to level nine will be home to a hotel. Colliers International's Nick Pelvay and Aimee Guo have been appointed marketing agents. “The residential and serviced apartments will have separate car parking, entrance lobbies, and lift access from the residential,” Mr Pelvay said. The project will also incorporate a separate 21 storey student accommodation tower fronting Synagogue Place, which will incorporate approximately 268 beds with a ground floor cafe. Mr Pelvay said the project would be integral to the activation of the eastern end of the Adelaide CBD, including the activation and development of a key laneway, Tavistock Lane. “It will also benefit from the $50million expansion of the AdeLINK tram network, which will see trams extended along North Terrace to the East End, and the forthcoming redevelopment of the Old Royal Adelaide Hospital,” he said. “Kyren Group has developed in excess of $500million worth of local projects to date and has a strong reputation as a developer who moves quickly on projects and delivers on time. “All 88 Apartments will all have completely unobstructed, outstanding views in all directions, so we’re anticipating strong interest from the local market and Asian markets, particularly in the two and three bedroom dwellings,” Mr Pelvay said. “Adelaide offers a magnificent and convenient lifestyle increasingly facilitated by the convenience of apartment living in inner city locations close to shops, restaurants, cultural and sporting venues and entertainment facilities and we expect strong interest from potential residents as a result.